Your keys, not unlike your wallet or smartphone, can be quite fickle. One minute, you swear that you left them on the kitchen counter, but to your surprise, they’re somehow clipped to one of your belt loops. You are not sure how this is possible, but it probably has something to do with black magic. The next day, you’re out for a casual stroll around the neighborhood because it’s a beautiful day outside. This time, you’re absolutely confident that your keys are safely clipped to your person, and they’re not going anywhere. Sure enough, you find yourself locked outside of your apartment with no keys to bail you out. 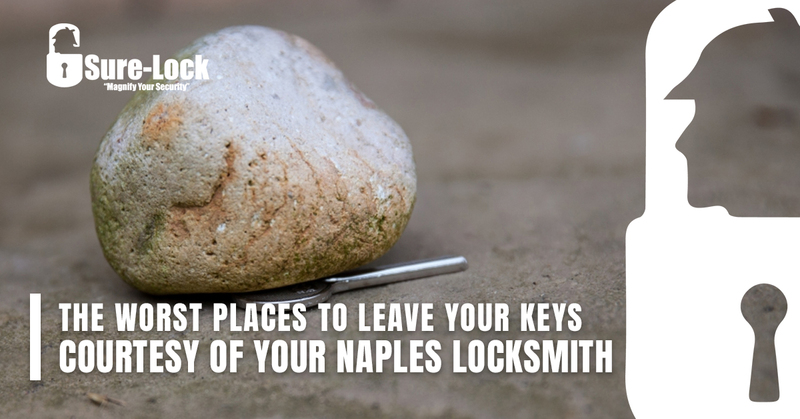 It’s time to make another shameful call to your residential locksmith in Naples, Sure-Lock Locksmith. Maybe you should have left your keys safely inside of your pocket this time. Every single day, all around the world, people experience unfortunate situations like these. It’s a darned shame that people routinely (okay, for most folks, occasionally) lose their keys, but hey, life happens. Folks in Naples, Bonita Springs, Marco Island, Fort Myers, Ave Maria, and other Southwest Florida communities can rest assured that Florida’s Top Rated Local® Locksmith is on the case. In a previous blog, Sure-Lock Locksmith covered how to not lose your keys. In a mildly amusing twist, we offer some of the worst places to absentmindedly leave your keys in this post. Let’s get started. Most folks tend to have a doormat to welcome their guests and wipe off their paws. Most criminals will also check this area for a key. Don’t be a fool and lazily hide your key right next to your door. If you drove to the bar, you’re doing it wrong, unless you’re the designated driver. Of course, if you were tasked with DD’ing, you wouldn’t have left your keys there. Come to think of it, leaving your keys at the bar is a wise choice if you’ve had more than a few drinks. That way, it’s physically impossible to drive home. Not unlike hiding your key underneath a doormat, doing so under a fake rock isn’t going to fool a smooth criminal. You should have many rocks around it if you’re going to do this, and that fake better be pretty convincing. If you’re a surgeon, make sure not to leave your keys hanging on the overhead light. We’re not medical professionals, but that’s our strong recommendation. We tend to be forgetful, especially when we’re in a rush. It’s easy to accidentally leave your keys in your ignition when you’re running a few errands after a brain-draining day at the office. Just take the extra three seconds to take a deep breath and take your keys with you. You’ll thank yourself when you walk back out to a car that’s still there. Sure-Lock Locksmith will always be here for you when you’ve misplaced your keys. Just contact us at any time and we’ll bail you out.